When you stalk as many beauty blogs as I do, you start to notice trends amongst the products reviewed/swatched. Urban Decay Naked palettes, Ciate Nail Art Kits, Stila Foil Finish Eyeshadows... the list goes on! Such was the case with Obsessive Compulsive Cosmetics Lip Tars. Fellow beauty addicts will relate: when you're lemming for a product this hard; nothing, not shipping restrictions, not customs tax, nothing can get in the way of you getting your grubby little hands on your precious! So you can understand my utter joy when I discovered these beauties in the Bellabox Shop. Not only that, I had a discount code; SCORE! I ordered these maybe a week or so before Christmas and to my delight, they turned up just a few days later. Bellabox for the win! I purchased two shades; Queen (neon red coral) and Pretty Boy (rich fuchsia). Read on for the swatches and review. Hey folks! Long time, no see! Like most of you, I've had a very busy couple of weeks, what with Christmas and all that jazz. In my self imposed blog absence, I also did a nifty thing and turned 25! I'm finally smack bang in the middle of my twenties and to celebrate my lovely family took me out to a fancy lunch at C Restaurant in the CBD. For those of you that don't know, C Restaurant is Perth's only revolving restaurant and it's located at the top of St Martin's Tower and provides a truly excellent 360º view of the city. It was quite fashionable back in its heyday in the middle of the 90's mining boom. The restaurant has all the typical WA fine dining tropes; French waiters, an excellent wine list and 3 different types of steak. We had the two course luncheon ($55/head) as the dessert selection sounded a little lacklustre to be honest. Pictured above is my baby brother's entree; Butter poached Manjimup marron tail, served with quinoa salad, mango relish, seared scallop and cilantro pesto. As you can see, the dish was visually stunning, and according to baby bro, the mango relish was delish! Hey guys! Remember me? I'm still here, I promise! The reason I haven't been posting as much as usual is because I got a new job! A proper grown up, real world job. Unfortunately, with this job comes a crazy new sleep schedule... and by crazy new sleep schedule, I mean trying to fix an intense, aimless late night internet browsing habit and actually sleeping like a normal person. I'm sure my body clock will adjust soon though! I have a bunch of awesome posts lined up... I just have to finish them. So stay tuned! Just a quick one today! I recently picked up these two lovelies during one of my ritual Priceline binges and fell in love almost immediately. 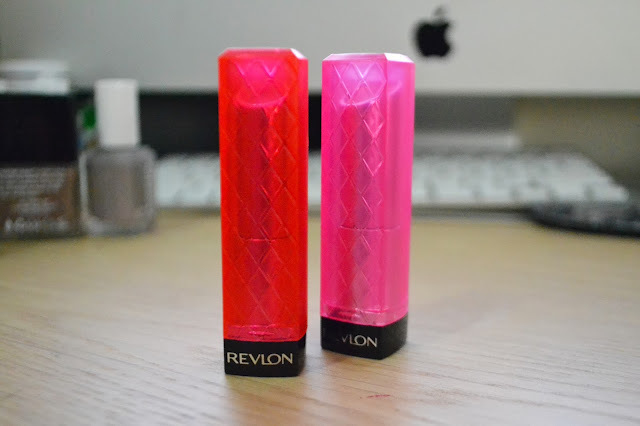 I was already a big fan of the Revlon Colorburst Lip Butters and these two shades from the 2013 Spring/Summer Collection are utterly perfect for the warmer weather now upon us! Wild Watermelon (left) is a lovely bright pink/orange that builds up to opacity in just a few swipes. Sorbet is an intense blue based fuchsia that again, can be layered for an opaque colour. Both shades are sheer cremes that don't have any shimmer or glitter. They kind of remind me of jelly! Read on for swatches.